Privatising roads might be silly, but does it really matter? So the government is looking into some form of privatisation of the motorways and trunk roads that are still under their control — that is, the English Highways Agency network. It sounds radical, it sounds like it could be frightening, it sounds almost like a parody. Actually, it’s boring. It’s probably even more boring than the familiar private roads like the M6 Toll and all our big motorway suspension bridges. It will probably turn out to be about as boring as the management of motorways and trunk roads in Scotland, where private companies manage and maintain the roads using railways-style regional franchises. You’ll know them by the names and emergency contact numbers plastered over the countryside on massive signs, but otherwise, the difference they make to the road user is entirely hidden: the roads are still toll-free and they’re still full of potholes. As far as I can tell, the main purpose of this kind of “privatisation”, like with Network Rail, is as a quick way of fiddling the accounts on the national debt. The extra billions that these things inevitably end up costing taxpayers are apparently worth it for the extra tens of billions of borrowing being kept off the national books, so that George Osborne can appear to be on trajectory for his arbitrary debt reduction target. I wouldn’t worry too much about any implications for cyclists. England’s trunk roads network is way beyond the stage where anybody would dare cycle on it. 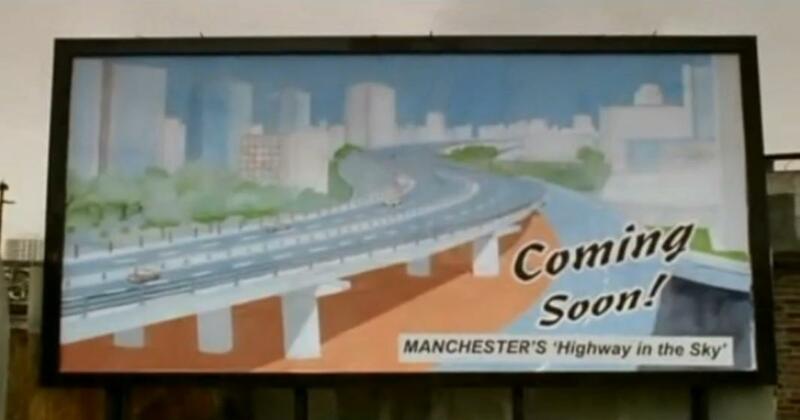 We’re talking about motorways and motorways in all but name. Where things might matter is with the prime-minister’s suggestion that privatisation might allow large-scale road construction programmes to recommence, with the idea that companies who build new roads could collect tolls on them capturing the headlines. It would be a shame if this happened. The Tories should try to think back and remember why they abandoned that approach last time. But do we actually have to worry about a return to large-scale motorway construction led by private investors? I not sure we do. Quite aside from the many reasons that forced the Tories to abandon that unpopular policy last time around, I can’t imagine the private sector wanting to invest in a dying technology. Local Transport Today reported this week that, despite private motor vehicle use in London being in near constant decline for thirteen years, the Department for Transport are standing by their prediction that in two decades time, traffic in London will be a whopping 43% above 2010 levels. Similar predictions are made for the rest of England, with 44% in the country as a whole. Given the exodus of young people from learning to drive, who do they think will be driving this traffic in the mid 2030s? What technology or fuel are they expecting to be an affordable means of powering all this traffic? Where do they think it’s going to go? This is the city whose streets are famously “too narrow”, whenever you propose giving some street space to something other than private motor traffic, but which apparently have room spare for 43% more of that. 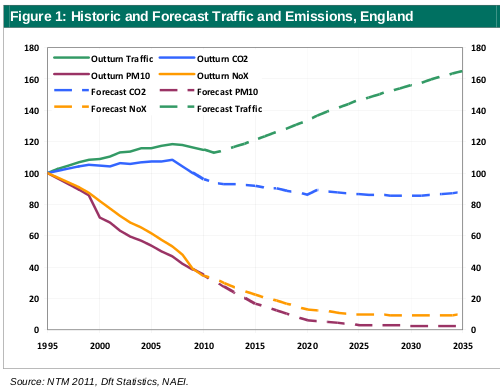 What purpose could such absurd and crudely fantastical forecasts of traffic growth and confident rejections of the idea that motoring has peaked and is passing have? Is it perhaps meant to be the prediction in a predict-and-provide programme? Or is it less a prediction and more an ambition, for this greenest-ever-government? Are they pining for The Great Car Economy? It’s true that car use fell in tandem with the economy, but if we want to stop the plummeting economy, we have to come to terms with the fact that both falls are merely symptoms of the fact that the cheap fuel that powered both cars and economy is a thing of the past. The lines on that graph simply aren’t possible these days. Whatever. I can’t see private investors having such confidence in roads as a growth market that’s worth putting their money in. Unless someone can give them plausible answers to the questions like “by the time the road is built, who will want to drive on it?” and “how will they power their vehicles, and how will they be able to afford that?”, I’m not sure they’re going to want to take the risk on a the basis of a made up graph. This quite aside from experience with the M6 Toll Road, whose operating income still doesn’t, and didn’t even during the economic boom times, come close to paying off the annual interest on its construction costs, despite attempts by the road’s owners to encourage new development around its junctions. Turns out that, despite their moaning, most people are quite happy to sit in traffic jams on the old roads if it saves a few quid on the toll. But there is potentially another reason why Cameron might want to offload our motorways, beyond fiddling the national debt or encouraging new construction. The old Severn Bridge is falling down. The Scots are spending £790 million replacing the Forth Road Bridge (though nearby infrastructure projects suggest that the final bill might end up at £7.9 billion). Who knows how much the emergency repairs to the Hammersmith Flyover will end up costing London? The main motorway and trunk road construction boom began in the late 1950s, and a big chunk of engineering is about to reach the end of its design life, corroded and crumbled by rock salt, ice and billions of truck movements. What if privatising the motorways is just preparation by central government for distancing themselves from the difficult decisions of whether to repair, replace or abandon our collapsing concrete highways in the sky? The Department for Communities and Local Government put these words in a press release and today 221 national and local newspaper journalists* copypasted them into their newspapers, noticing nothing nonsensical in their conjunction. Great job, The Media. The press release was announcing the abolition of two ten year old Labour policies: Planning Policy Guidance 13: Transport (PPG13), and Planning Policy Statement 3: Housing (PPS3). The department spin this as the abolition of an “encouragement” to local councils to charge for town-centre car parking, and of a rule that limited car parking in new developments in the hope that fewer residents would own cars as a result. Given that the war “on” motorists is a war between motorists as ever more of them compete for increasingly scarce land and resources, these policies will of course merely serve to make people’s lives even more miserable as they sit in a whole new level of congestion. Not that I expect there to be any noticeable difference to most people’s lives as a result of this policy — it’s a drop in the ocean given the mess that we’re in. And anyway, the policy merely devolves these decisions to local councils, who are unlikely to make any changes given their own dire situations. Philip Hammond said, “this Government recognises that cars are a lifeline for many people.” Which is interesting, because a lifeline is “a line to which a drowning or falling victim may cling to.” The person on the end of a lifeline did not intend to be there, and he does not intend to stay there. To get there, something has gone wrong, and the lifeline user intends to leave the lifeline behind as soon his feet are safely back on solid ground. Lots of people will tell you that they have no choice but to drive a car, but most of them would rather they didn’t have to. The car is a lifeline that have grasped after the doctor’s surgery closed, and then the butcher and baker closed, and then the library closed, and then the post-office closed — all because of the rise of car-dependent development around them. These people don’t want to have to drive twenty miles to town. They want their services back. Philip Hammond’s policy is to encourage new developments that force people to use a car against their will; he’s pushing you overboard and expecting you to be grateful as you’re dragged along on a “lifeline”. But this is no excuse for giving up. It is a fact that there is far more wrong with recent development patterns than just car parking; car parking alone does not create car dependent communities. But we have to tackle all of the problems — we need more action, not less — and car parking was a start, at least. And of course, Hammond again plugs his hoverboard development programme. I know I should have no reason to be surprised by the depths to which British politicians and newspapers can sink, but the scale of the current farce is just amazing. It looks like Hammond’s entire tenure as transport minister will be based on the recurring pantomime of riding his magic car to rescue the beautiful Motorist from the nasty Labour men and their War. Apparently this is the “new kind of politics“. * or, rather, 221 websites indexed by Google News, which is an overlapping, but not identical set. And some of nationals at least didn’t swallow the line whole. Even the Department of Transport’s own figures show a benefit to cost ratio of 3:1(links to PDF) Cycling England do excellent work, with a high profile for a team of only three full time member sof staff, getting school kids cycling by identifying safe cycle routes, helping to build cycle racks, and coordinating the national institution that is the Cycling Proficiency Scheme. 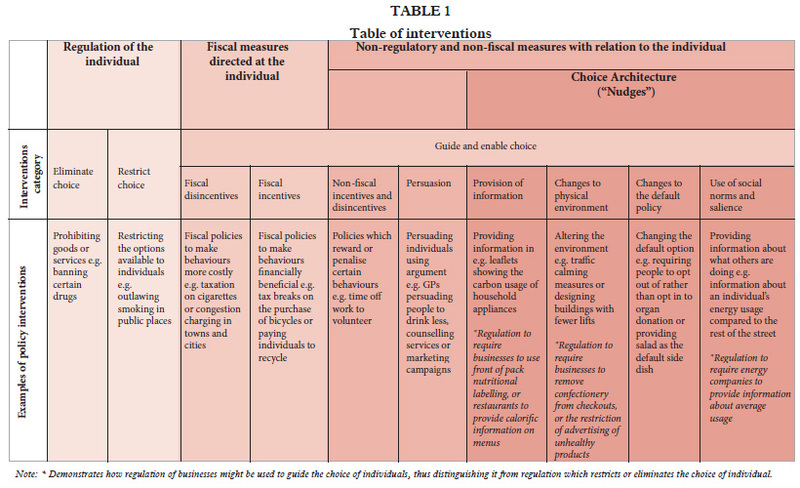 If we’re to combat childhood obesity, doing things like cutting Cycling England and cutting free swimming are the stupidest things imaginable: they lower the likelihood that exercise becomes part of peoples routines at an early age, and have such high returns for such low costs that they make no difference to the spending of the public sector. Until, that is, 30 years down the line, heart disease and stroke rates implode. Just yesterday, ministers reported that school sports were growing, but not fast enough and that interest in cycling was surging. And now they are cutting an organisation that fosters exactly that. The loss of the Disabled Person’s Advisory Committee is indicative of the lack of consideration towards disabled people and their transport needs that has become endemic. Recently, as reported here by Adam Bienkov, the Tory London Assembly Members walked out of a debate on staffing at TfL ticket offices whilst members of disability rights group Transport for All campaigned outside. It’s tough enough to get around cities and rural areas with a disability, without having local and national government decide they’d rather save a few pennies than ask you what you need, or how you’d like to get around the streets and community you call your home. But when a government reduce society to pennies, pounds and economic terms instead of people, families and community bonds, that’s what we get. So in summary, this government don’t care about public transport. They don’t care about eco-friendly transport. They don’t care about transport that benefits people. They don’t care about transport that benefits the marginalised. They don’t care about transport that works for the poor. They don’t care about the type of transport that most people in cities use. They hate bus passes, they hate bikes, they love cars. I hate this government.